¹The Methodist Episcopal trustees obtained land on the west end of lot 16, concession V, Uxbridge, and a Methodist Episcopal Church was dedicated there on December 14, 1870. It was known as Forsyth's or Rusnell's Church, and was on the Uxbridge circuit until union in 1883-84, when it became a part of the Goodwood circuit. A new foundation was put under the building in October of 1887. It became Fifth Line United Church in 1925, and was closed in 1966. 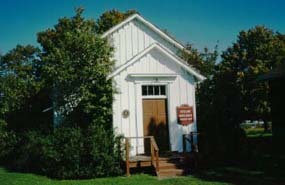 The church was moved to the Uxbridge Scott Museum site in 1979. Collection items on display include two organs and a piano which were made by a factory in Uxbridge that was in operation from 1873 to 1914.